Are you a descendant of immigrants who settled in a large US city around the turn of the twentieth century? If you answered yes to either of these questions then the following post is for you. American cities during in the late 1800s and early 1900s underwent tremendous growth as industrialization beckoned both ambitous capitalists and low income workers, including large numbers of immigrants, to urban centers . Chicago specifically (where my immigrant ancestors settled) saw unparalled growth as the city rebuilt in the years following the great Chicago Fire of 1871. While on the one hand, this rapid growth inspired a great deal of pride among City- dwellers, it was also blamed in part for a whole host of problems: Crowded slums, violent labor disputes, polluted air, inadequate public works leading to filthy city streets and contaminated Lake water to name a few . Social and religious reformers saw other problems in America’s cities as well. They disapproved of the leisure time pursuits of many urban workers, namely, gambling and drinking . As middle and upper class reformers set out to address these issues, philosophies such as the “rational recreation” and “parks movement” began to take hold which propagated the idea that parks and green space inspired morality. If individuals could pursue wholesome forms of leisure, they would in turn become better citizens, the philosophy said. Perhaps, reformers hoped, they could replace what they perceived as the gambling and drinking culture of immigrants with wholesome sport and leisure, thereby “Americanizing” and “homogenizing” divergent groups . This era saw the inception of our modern sports culture . During this time, the American Parks and Rec movement was born  . YMCAs sprang up in cities around the country. In one Massachusetts YMCA, James Naismith invented basketball in 1891 . Industry leaders encouraged sports participation with the creation of industrial leagues in effort to control the leisure practices of workers and increase productivity  . Jane Addams’ “Hull House” became a prototype for charitable organizations, offering playgrounds and sports recreation to community members . City planners considered the inclusion of green space as a necessity for its citizens, creating parks for the enjoyment of all . Baseball became “America’s sport” as immigrants and domestic-born citizens alike embraced the game and its local heroes. Though the golden age of the recreational reform movement died out during the Great Depression, the sporting culture it fostered remained . So what does this have to do with genealogy specifically? Well, besides the fact that good genealogy understands historical context, it also means you might find record of your ancestor thanks to their participation in sport, which is exactly where I am in my family research at the moment. 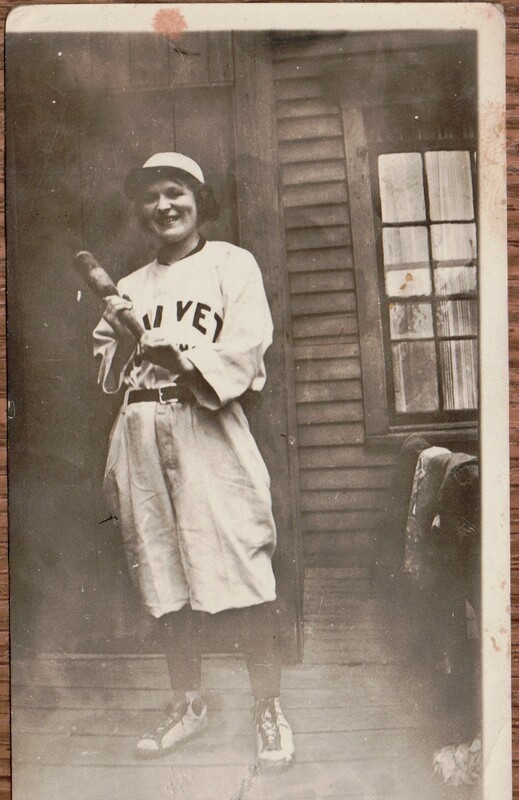 The pictures below are of my Great-grandmother in a Baseball or Softball uniform. I scanned this photo from a family album last June. Obviously, she must have played on a team, but no one knew exactly for whom or when. Of course, I wanted to know more. The photos aren’t dated, but I am guessing based on her birth and marriage date that they were taken sometime between 1915 and 1919 (yes, during the World War I era) . I knew the family attended First St. Paul’s Lutheran Church and I also knew that my Great-grandma worked for Featheridge Rubber Company a few years later . My first thought was that she might have played on a Lutheran League or an Industrial League, but it was through the uniform in these pictures that I was able to solve the mystery. From these two pictures, I could see that the last 4 letters of the team name are “I V E T.” It also looks like the first letter is maybe an O or a D. Then it looks like the smaller letters underneath are “IN.” So, my guess is that the team name is “OLIVET” which is often a name with religious connotations. I went to my good friends at Google and typed in “Olivet Baseball, Chicago” and “Olivet, Chicago.” Most of the resulting hits referred to Olivet Nazarene University. This did not seem like a logical connection since the University is located a good distance from the North side neighborhood where my Great-Grandmother grew up , and she almost certainly she never attended to college. I was tempted to terminate the search here, concluding that the team name on her uniform was illegible. I really didn’t have any other leads to follow, so I mulled the problem over for a few days and read the fascinating Windy City Wars by Gerald R. Gems. I highly recommend this book if you are at all interested in the sports reform movement in Chicago. Not only did I learn a great deal about how this movement manifest itself in Chicago specifically, but I also have a whole host of original records and educational journals to look up thanks to the book’s copious footnotes. Then, I got lucky. Instead of searching Google, whose algorithms find hits most relevant to the present day (not 1915-1920), I decided to search ARCHIE, the research catalog for the Chicago History Museum. I typed in “Olivet Baseball.” A photograph popped up of a 1908 Olivet Men’s Baseball Team, with the player’s names listed . I noticed that many of the players had German surnames. My Great-Grandma was German, and lived in Old Town which at the time had a high concentration of Germans  . I was hopeful I was on the right track. I followed the links given on the photograph’s description to learn that the Olivet Institute (remember the small letters on the uniform in question started with IN) was a faith-based “settlement house and community center” located on the Near North Side offering “educational, recreational, and welfare services to local residents.” The institute was absorbed by the Chicago Commons Association in the 1960s. The CHM has a 6! boxes of material from the Olivet Institute ! Next, I went over to my Chicago Tribune Archive database to find out more. I learned just from browsing a few articles that prior to a location move in the 1920s, and during the years my great-grandmother would have been a likely participant, the Olivet Institute was located at 701 Vedder Street . Of course, as is often the case in when researching in Chicago, this address no longer exists. So I hopped on over to my friends at “A Look at Cook.” to find the corresponding present day address. Sure enough, the Olivet Institute was located two tenths of a mile from my Great-Grandma’s childhood home . So is that enough evidence to conclude my Great-Grandma played baseball at the Olivet Institute? I would say it all looks very promising, though I would love to find further evidence. I am very much looking forward to upcoming trip to Chicago when I can hopefully take a look at the CHM archives for myself. Maybe I’ll find collaborative evidence there. 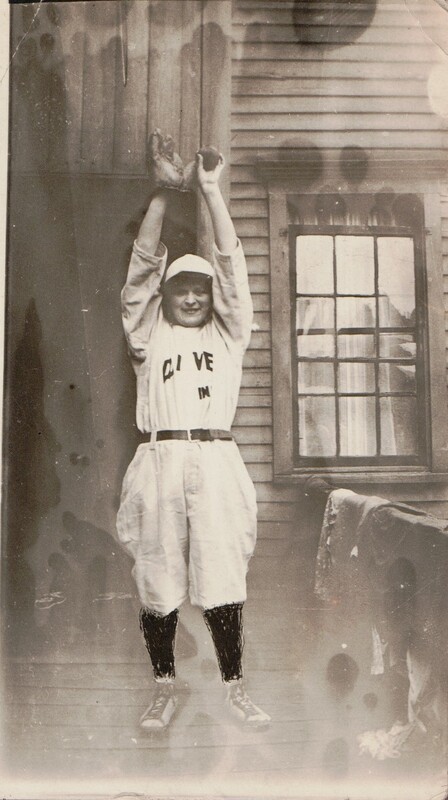 This photo is not the only hint that my ancestors were active sports participants. I also plan to research Great-Uncle’s supposed boxing talent with the Catholic Youth Organization and look for evidence that my Irish Great-Grandfather played soccer after his arrival in the US. Do you suspect you may have a sporting past in your Chicago family? If so, there is no shortage of stones to unturn in your search. Gem’s book alone references nearly one hundred different leagues or organizations of which your ancestor may have been a member. Check it out, and I wish you luck on your search! Gary Cross, A Social History of Leisure since 1600, (State College: Venture, 1990), 87-88. Also, Donald L. Miller, City of the Century: The Epic of Chicago and the Making of America (New York: Simon and Schuster, 1996), multiple pages, including chapter 13. 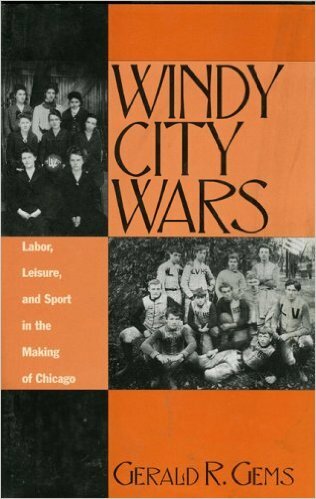 Also Gerald R. Gems, Windy City Wars: Labor, Leisure and Sport in the Making of Chicago (Lanham, MA: Scarecrow Press, 1997), 17. For growth and pride see Miller, City of the Century, 446-448 Also Gems, Windy City Wars, 62. For problems see Gems, Windy City Wars, 64. Also Miller, City of the Century, 457. Gems, Windy City Wars, many pages, specifically 23, 81-82, 115-116. Also Miller, Windy City Wars, 460. Cross, A Social History of Leisure, chapter 7. Also Gems, Windy City Wars, many pages including 23. Gems, Windy City Wars, xiv. Cross, A Social History of Leisure, 146. Gems, Windy City Wars, 12-13, 116. Cross, A Social History of Leisure, 81-82. Gems, Windy City Wars, 77-83. For Birth see [name withheld] Family Bible Records, circa 1925, Heilige Schrift (Chicago: Chicago Publication and Lithograph Co., no date), privately held by [name and address withheld], Illinois, 2015. Record is on a looseleaf sheet of paper. For marriage see Illinois, Cook County Marraiges, 1871-1920, [names withheld], 25 May 1918, certificate number 798006, FHL microfilm 1030674. [name withheld] family photos, privately held by [name and address withheld], Illinois, 2015. 1910 U.S. Census, Cook County, Illinois, population schedule, Chicago, ED 947, Ward 22, p. 21, dwelling 4, family 6 [name withheld], digital image, Ancestry.com (http://www.ancestry.com: accessed October 2015). Also 1920 U.S. Census, Cook County, Illinois, population schedule, Chicago ED 1217, Ward 22, p5A, dwelling 48, family 104 [name withheld] digital image, Ancestry.com (http://ancestry.com: accessed 21 Oct 2015), though she married and moved away, the family is still at the same address as the 1910 census. Chicago Daily News, Inc. Photographer, Olivet Indoor baseball team players posing in front of a light colored background in a room, photograph, 1908, digital image, Chicago History Museum Research Center Catalog (http://chsmedia.org: accessed 21 Oct 2015). Miller, City of the Century, 136. Olivet Community Center, Olivet Community Center records [manuscript], 1885-1966, summary and description, Chicago History Museum Research Center Catalog (http://chsmedia.org: accessed 12 Oct 2015). Bible as Model For Child Work: Boy and Girls of Olivet Institute to Build Altar, Ark and Jacob’s Ladder, Chicago Daily Tribune (1872-1922); Jan 31, 1912; ProQuest Historical Newspapers: Chicago Tribune, p 9. See also, Oney Fred Sweet, Olivet Serves as Model For Social Service, Chicago Daily Tribune (1923-1963); Dec 1, 1929; ProQuest Historical Newspapers: Chicago Tribune, pB1. Street Name Changes, A Look at Cook, PDF File (http://www.chsmedia.org/househistory/nameChanges/start.pdf ; accessed 21 Oct 2015).